Let us turn our attention to Alexander Barclay’s Civil War Service record and see if we cannot find any clues to this mystery of which brother “Marched to the Sea’ with General Sherman. I obtained Alex’s Civil War service record from the National Archives before they increased the fee and see the Blogroll to the right for the link. 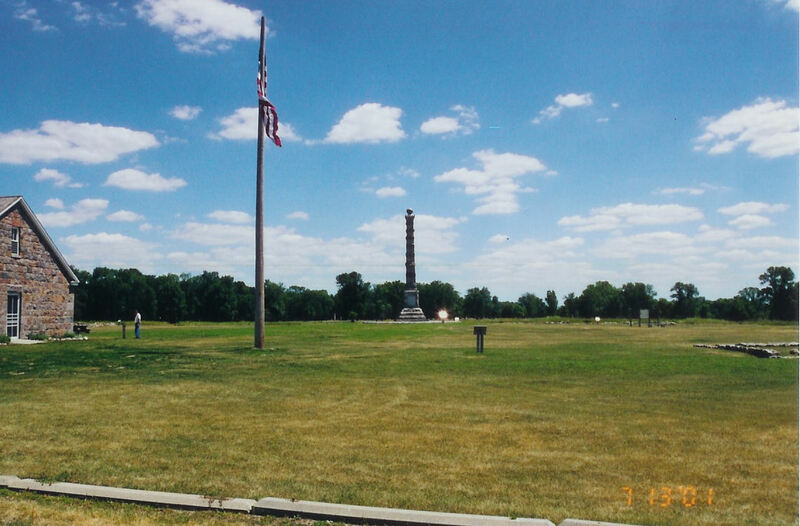 George’s brother Alexander Barclay mustered in to the Civil War at Fort Snelling approximate one year before George. I visited Fort Snelling near Minneapolis and St. Paul. 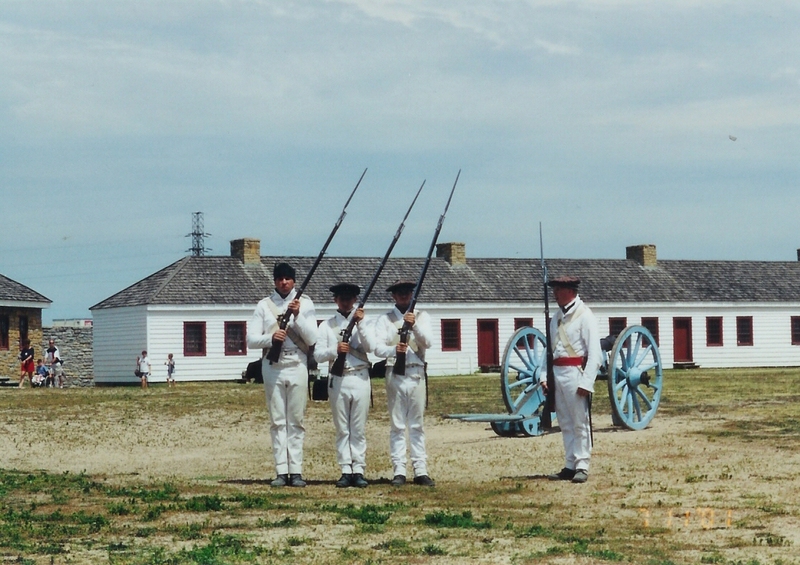 The photo shows the fort as it was in about 1827, which is 34 years earlier than the Civil War but inside the museum buildings they have maps and pictures that show the fort through the years. It gave me an idea of what it might have been like for both George and Alexander. The Minnesota Historical Society has many historical properties like this that you can visit if you become a member and travel in Minnesota. I have a link under Blogroll to the right for the society. Alexander’s Civil War Service record was listed under “Barkley.” Alex has 27 cards in his service record. Alexander Barkley, Pv, Co., C, 4 Reg’t Minnesota Infantry. Nov. & Dec. 1861, Present, R.M. Elliott, Copist. Jan & Feby, 1862, Present, R. M. Elliott, Copist. Mch & Aprl, 1862, Present, R.M. Elliott, Copist. May/June 1862, Present, R.M. Elliott, Copist. July & Aug, 1862, Present, R.M. Elliott, Copist. Sept & Oct., 1862, Present, R.M. Elliott, Copist. Jan & Feb., 1863, Present, R.M. Elliott, Copist. Dated Apl 18, 1863, Present, Remarks: Sick in quarters., J.R. Funk, Copist. Mch & Apl, 1863, Present, J. R. Funk, Copist. May & June, 1863, Present, J.R. Funk, Copist. July & Aug. 1863, Present, Jr. R. Funk, Copist. Sept & Oct, 1863, Present, J.R. Funk, Copist. Nov & Dec, 1863, Present, J.R. Funk, Copist. Muster-out to date Dec 31, 1863, Last Paid to Oct. 31, 1863. Roll dated Huntsville, Ala. Feb. 5, 1864. Clothing account: Last settled Dec 31, 1862; drawn since $23.23, due soldier $18.77. Due U.S. – $100.00. Remarks: Dischged by virtue of re-enl. as Vet Vol. under the provisions of G.O. 191 series of 1863 from the W.D., H.E. Arnold, Copyist. Roll dated Huntsville, Ala. Feb. 5, 1864. When enlisted Jan 1, 1864, When mustered into date Jan 1, 1864. Bounty paid, $60.00. Remarks: Remustered as Vet. Vol. under G.O. No. 191, War Dept. Series 1863., Wines, Copist. NOTE: There were two enlistment papers in Alex’s file. First page: his “Volunteer Enlistment” in Alabama at Huntsville. Alexander Barkley born in Hartford Co., Connecticut, aged nineteen years, by occupation a soldier do hereby acknowledge to have volunteered this first day of January 1864 to serve as a Soldier in the Army of the United States of America for the period of 3 years….sworn and subscribed to at Huntsville, Ala. this 1st day of January, 1864 before Wm. T. [Killbridge], Reg’t 4th Minn., signed Alexander Barkley. Examined by E. W. Cross, 4th Minn. Vol. Inft. Examing Surgeon..the soldier has hazel eyes, light hair, light complexion, is 5 ft, 3-1/2 inches high. [James C. Edson, Cprt. 4th Reg. of Minn. Voltrs. Mustered into service…C. 4th Reg. of Minnesota Vol. on the first day of January, 1864, at Huntsville, Alabama, [ ] W. Osborne, Capt. 12th Infantry, A.C. M. 3rd Div. 15th Army Corps. The second page was the “Declaration of the Recruit” which repeats much of the same information listed above. Jan & Feb. 1864, Present, Vet. Vols., J.R. Funk, copist. Mch & Apl, 1864, Present, Remarks: Vet Vol., J.R. Funk, Copist. May & June, 1864, Present, Sullivan, Copist. July & Aug., 1864, Sullivan, Copist. Sept. & Oct., 1864, Present. Remarks: Promoted from Private Oct. 12, 1864 S.O. 47, Regt. Hd. Qrs., Sullivan, Copist. Corpl. Alexander Barkley, Co. C, 4th Reg’t Minnesota Infantry. Nov. & Dec., 1864, Present, Remarks: Promoted from private Oct. 12, 1863 S.O. 47, Regt. Hd. Qrs., Sullivan, Copist. Note: Sherman’s March to the Sea started on Nov. 18, 1864. Jan & Feb, 1865, Present, Remarks: Appointed from private Oct. 12, 1864. S.O. 47, Regt. Hd. Qrs., Sullivan, Copist. Mch & Apr. 1865, Present, Remarks: Promoted from private Oct. 12/64 S.O. 47, Reg. Hd. Qrs., Sullivan, Copist. Alexander Barkley, Corpl., Co. C, 4, Reg’t, Minn. Inf., Age 21 years, roll dated Louisville, Ky, July 19, 1865, Muster-out date, July 19, 1865, Last paid Apr. 30, 1865. Clothing Account: due U.S. $15.00. Due US for arms…$0, Bounty paid, $210.00; due $190.00. Remarks: Promoted from Private Oct. 12/64. Easterling, [Compant/Compaut]. Note: Brackets indicate that I cannot read the writing and I am guessing. There is nothing in Alexander’s Civil War Service record that states anything unusual about his service other than he re-enlisted at the end of 1864 and was promoted to Corporal about the time of Sherman’s march. The spelling of the Barclay name as “Barkley” means that Alex used a different version than his brother George. In the next post we will examine the events of Co. C, 4th Reg’t of the Minnesota Infantry and we will discover some very interesting information! George Barclay served from August 15, 1862 to August 24, 1865. He had 23 cards in his Civil War Service File with various numbers. There was a #75 at the top of the summary card. D.C. Shoemaker a retired career military man who had served in the Quartermaster Department and a Civil War buff was kind to help me interpret some of the information on George’s Civil War service record cards. D.C. and I were co-workers in years past and I was lucky to be able to sit with him and learn. I have not had any military experience and D.C.’s help was greatly appreciated. D.C. also explained that the term “muster” was more like a roll-call where they would line up the men and actually count them and physically take stock of what they had. George Barclay, Co., I, 9 Reg’t Minnesota Inf. Enlistment: When: Aug 15, 1862, Where: Shakopee, By Whom. Jos R. Ashley, term 3 y’rs, Remarks: none. J. Baker Copiest. The Civil War Pension file gives his weight at 125 lbs in 1892. This information from his pension file, is of course years later. As you can see he was not a large man. Company Muster Roll of the organization named above. Roll dated Fort Ridgely, Oct. 12, 1862. Muster-in to date August 15, 1862. Joined for duty and enrolled: When Aug. 15, 1862, Where Shakopee, Minn. Period 3 years. Bounty paid $25.00/100; due $ 0/100. Remarks: Premium paid $200; advanced pay $13.00. Signed J. B. Jones, Copyist. Company Muster Roll for Oct. 12 to Oct 31, 1862, Present, Remarks: Wagoner Q.M. Dept., signed J.B. Jones, Copyist. November, 1862. Teamster; Jan. 1863, Teamster in Q.M. Dept. ; April 1863, Co. Cook. Oct. 1863. On extra duty in R.Q.M. Dept. ; Dec. 1863, Acting Q.M. Serg’t. ; Jan. to Sept. 1864, Mch, 1865 R.Q.M. Dept, *Appears also as Barklay & Barkly, signed C. H. Underwood, Copyist. Note: R.Q.M refers to Regimental Quarter Master. Teamster meant he drove the team. D.C. explained that as Acting Sergent at Q.M. it indicates that he was promoted to “brevet.” This means he had the title, the authority, but not the pay. 5. 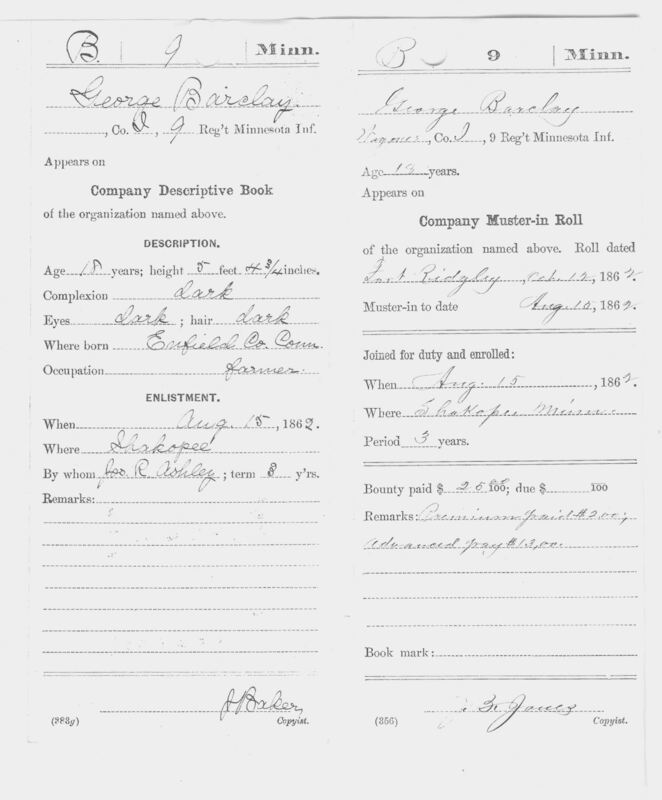 Company Muster Roll – Every card from this point on states he is a Wagoner with company I, 9th Reg’t. Minnesota Infantry. for from enlistment to Dec. 31, 1862, Present, sign J.B. Jones, Copyist. for Jan. & Feb. 1863, Present, signed J.B. Jones, Copyist. for March & April, 1863, Present, Remarks: Cook for Company, signed J.B. Jones, Copyist. for dated April 11, 1863, Present, signed J.B. Jones, Copyist. for May & June, 1863, Present, signed J.B. Jones, Copyist. Note: D.C. thought he was put on light duty because he could have been sick or injured. for July & Aug. 1863, Present, signed J.B. Jones, Copyist. for Sept. & Oct., 1863, Present, Remarks: Daily duty Q.M. Dept., signed J.B. Jones, Copyist. for Nov. & Dec. 1863, Present, Remarks: Daily duty in Q.M. Dept., signed J.B. Jones, Copyist. for Jan. & Feb. 1864, Present, Remarks: Daily duty in Q.M. Dept., signed Howel, Copyist. for Mch. & Apr. 1864, Present, Remarks: Daily duty in Q.M. Dept., signed Howel, Copyist. for May & June, 1864, Present, Remarks: On daily duty in Q.M. Dept., signed Howel, Copyist. for July & Aug, 1864, Present, signed Howel, Copyist. for Sept. & Oct, 1864, Present, Remarks: On daily duty in Q.M. Dept., signed Howel, Copyist. for Nov. & Dec. 1864, Absent. Remarks: “On [D.S.] with Brigade Quartermaster since November 22, 1864, signed Howell, Copyist. 19. Apears on Muster Roll of enlisted men on detached service at Hd. Qrs. 2 Brig., 1 Div. , Detachment, Army of Tenn.
for Nov. & Dec., 1864, Station: in the field Tenn. Present, Detailed from Co. I, 9th Minn, Infy in Q.M.D. SO. 38 Hd Qrs. 2d Bridg. 1st Div 16, A.C. November 22, 1864, signed Granes, Copyist. Note: Sherman’s March to the Sea started on Nov. 15, 1864! for Jan & Feb. 1865, Present, signed Howell, Copyist. for Mch & Apr. 1865, Present, signed Howell, Copyist. for May & June, 1865, Present, signed Howell, Copyist. Ft. Snelling Minn. Aug. 24, 1865, Muster-out date, Aug. 24, 1865, Last paid to Feb. 28, 1865. Clothing account: due U.S. $10.72/100. Bounty paid $25.00; due $75.00. Remarks. Retains knapsack, haversack (like a duffel bag) and canteen, under provisions of G.O. No. 114 C.S. A.G.O. Note: C.S.A.G.O means Chief of Staff, Adj. General Office. Based on this service record, I don’t think George was at Vicksburg which was fought from March to July 1863 and he wasn’t at Chattanooga which was in late 1863. The Civil War and Minnesota! My great-grandfather George Angus Barclay mustered into the Civil War a year after his brother Alexander Barclay. Their father John Barclay also served for a very short time as a carpenter, which was his occupation. They all served out of Minnesota. In the Logsled to Snowmobiles book written by the town of Pine River for their bicentennial in 1973, it is implied that George and Alexander entered military service together. This did not happen. Alexander went in first in Sept 1861 and George followed him a year later. There father served much later in the war. “…and together they enlisted on August 15, 1862 in the Union Army! pg. 104 Logsleds to Snowmobiles. First, I was lucky to get the Civil War service and pension files for a lot of the more common soldiers did not get recorded. Apparently my ancestors had skills that were needed. Secondly, George might have been too young and small to enter with Alexander, who was about 19 years old in 1861 when he mustered in. George maybe needed to mature physically or get some skills? My great-grandfather was not a big man as you will see. George would be 18 in 1862 and that might have been why he was delayed although I am aware that younger boys were in this war. It is fun to speculate. Back in 2001 I had the good fortune to travel to Minnesota and visit the state. 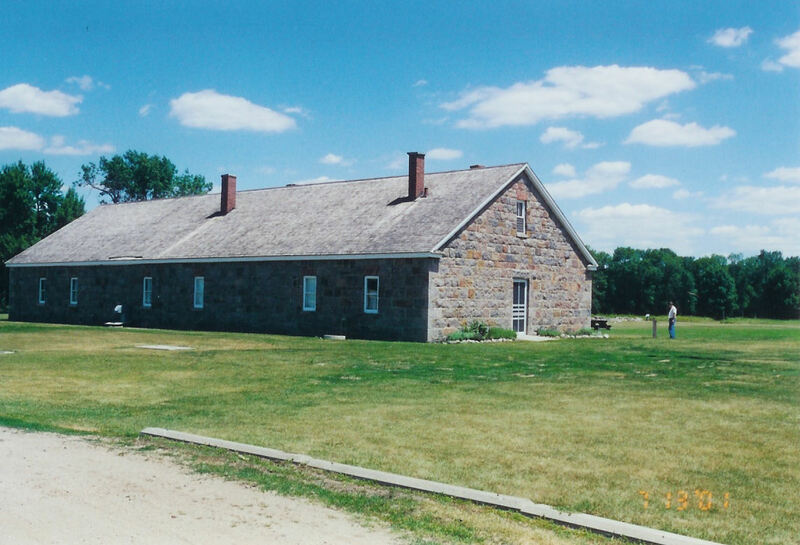 I became a member of the Minnesota Historical Society and they offer admission to various historical sites among them are Fort Ridgely and Fort Snelling. I was told that the farmers in the area took away the stones to use in their houses and fields after the Civil War. These stones had been used to build the barracks and other buildings at Fort Ridgely. The only remains are the outlines of the buildings in the ground so that is why you don’t see anything except the museum and monument. The museum has a lot of wonderful exhibits and one in particular was the soldiers’ uniform. I have often wondered what happened to George’s coat and was told he probably worn it till it wore out. They also have exhibits about the Dakota Indian uprising. I asked if George would have received any training and the volunteer at the museum told me that he probably was just dumped into the fight fresh. The monument you see in the first photo has the names of the soldiers that didn’t survive the conflict imprinted on it. The Fort Ridgely volunteer also got excited and looked George up in his records and found him. This statement is true about George’s service in the Civil War but he was in company “I” not “A.” He was a wagoner and he did serve and survived. A lot of men did not for my coworker friend told me that it was a cruel war. I was very fortunate to order the civil war service and pension records for George, Alexander and John Barclay before The National Archives (NARA) increased the cost. In my opinion it is worth it. I have learned so much about my ancestors from these files. I will describe the Civil War experiences of these three men in the following posts.